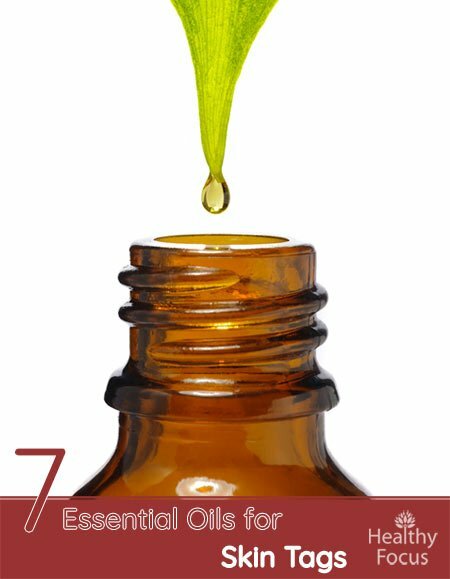 Essential oils are miracle oils, and they can be used to get rid of skin tags. Skin tags are small benign skin growths that are connected by a thin stalk of skin. They look like small bits of hanging skin, and they usually appear in locations where the clothing rubs against the skin. These tags, known medically as acrochordons, can appear on many parts of the body including the neck, upper chest, groin, or underarms. While they are totally harmless, they can be annoying and unsightly prompting many people to get them removed or to try and remove them at home. One popular treatment option is to use essential oils and this article will look at the most effective oils for the purpose. Skin tags are flesh-colored and look brown when seen on light-skinned people. The tags may either be wrinkled or smooth in texture and range from very small to about grape-sized in diameter. While you usually see the stalk of a skin tag, very small tags may look like raised bumps. If a skin tag is twisted, my turn black or red in hue. The tags may bleed if they become torn or caught on a person’s clothing. Skin tags are not painful and are not related to any other condition, except for diabetes. People who have diabetes and have an associated condition, called acanthosis nigricans, frequently display skin tags. A skin tag does not need to be medically treated unless it causes irritation or if the patient wants to remove the tag for cosmetic reasons. Because skin tags can readily be seen, lab tests do not need to be performed for a diagnosis. The tag can be diagnosed on visual examination. Some moles or benign skin growths or warts sometimes look like skin tags. Skin tags often appear as the result of friction between clothing and the skin. The tags appear often beneath the breasts of women and in the area of the underarms. They may also appear on the eyelids and the areas of the neck or the groin folds. Because the development of skin tags results from skin contact and the resulting friction, they appear most often in people who are obese. They are often diagnosed in older and middle-aged people. People with Crohn’s disease are often more susceptible to skin tags, as are women who are pregnant. The hormonal changes during pregnancy promote the growth of the tags, especially during the second trimester. Skin tags are not normally removed unless they are disruptive or irritating to the patient. They may also be removed for aesthetic reasons. When self-treatment is used, the patient may attempt to tie off the small stalk of the tag with dental floss or a thread. In most instances, a healthcare practitioner will remove the tags for cosmetic reasons. Concentrated plants oils, or essential oils, are the ideal way to remove a skin tag in the comfort of your home and without any difficulty. The oils, which are derived from leaves, bark, roots, flowers, or fruit, can be used to treat myriad skin conditions. When it comes to skin tags, these oils work by drying out the tag gradually and eventually causing it to drop off. All you need do is dilute the essential oil of your choice and apply it to the skin tag several times each day for as long as it takes. This may take weeks or several months depending on the oil that you have chosen to use and the size and location of the tag. While treatment with essential oils is considered safe and certainly nor as painful as tying off the tag, some oils can sting a little and could cause itching. This anti-inflammatory and antiseptic oil is one of the best essential oils (EOs) for getting rid of skin tags. It is obtained from the resin of the bark of frankincense trees. These plants are found in the Middle East and Somalia. The frankincense oil gradually dries out the tag and causes it to fall off. You can apply this oil without diluting it. All you need to do is apply a drop of frankincense essential oil on a clean finger and apply it to the tag. Do this two times a day for as long as necessary. You should protect the adjacent skin by applying coconut oil. When it comes to acne, research suggests the oil works because it destroys bacteria and helps to dry put the pimples. While there are no studies into its effectiveness on skin tags, it is quite possible for tea tree oil to have a similar effect in drying out skin tags. This oil is both an antiseptic and disinfectant. It fights bacteria and germs, which lead to the development of a skin tag. It is also consider a strong astringent, which causes it to dry out the skin tag. You only need to place a drop of the diluted oil on a cotton ball and tape it to the tag. Protect the surrounding oil with coconut oil to keep the healthy skin from being affected. Lavender essential oil is one of the gentlest acting and most popular of all the essential oils. It has excellent anti-inflammatory and antimicrobial properties making it a great choice for the skin. Either apply your lavender oil directly yo the skin tag each evening or you can make a lavender oil spray. Add about 10 drops of lavender EO to a spritzer bottle with water. Shake the mix well and spray on your skin tags to alleviate inflammation, redness, or irritation. Eventually, the tag will dry off and fall off. This anti-fungal oil can also be used to remove skin tags. Use this oil with care as it is very potent. You can make an ointment to apply to the skin by adding three tablespoons of shea butter into a bowl with the about 10 drops of oregano essential oil. Place the shea butter into a heatproof bowl, and melt it over a burner. Let it cool down for a couple minutes before adding the oregano oil. Pour the mix into an amber colored glass jar and allow it to set for 60 minutes. Apply the ointment with your finger to the skin tag. You can use this essential oil as both an antibacterial and antiseptic oil that fights the microbes that cause skin tags to form. To use this oil, add six drops of rosemary oil to a teaspoon of your chosen carrier oil, Use a q-tip to apply the mix on the skin tag. Use lemon essential oil to get rid of skin tags or dry them completely. The oil is photosensitive, so you cannot use it in the light of the sun. To apply this oil mix five drops with a one teaspoon of carrier oil, preferably coconut oil. Combine the oil in a small container, and apply it at night. Basil essential oil is considered a strong and reliable oil for getting rid of skin tags. This essential oil is an antiseptic, antifungal, and anti-bacterial oil. Antibacterial one of the best oils to use for the removal of skin tags, moles, warts, or acne. You can mix this oil with one teaspoon of castor oil and five drops of lavender. Use about 7 drops of basil essential oil in the mix. Apply the blend carefully onto the skin tag. Most essential oils used for skin tags are applied directly after being diluted with a carrier oil, such as coconut oil, olive oil or jojoba. If you wish to make an ointment, it is best to choose oregano oil, and mix it with shea butter. The only oil that does not need to be diluted is lavender, which can be applied directly to the skin tag. Having said that, it is always best to dilute any of your essential oils before applying them to your skin to protect against an adverse reaction. When choosing a carrier oil, you need to consider how the oil will be used. Will it be used in an ointment or in a cream? A carrier oil, such as coconut oil, is recommended for making a nighttime cream and is often used in combination with lemon essential oil. Shea butter is melted and mixed with oregano oil as an ointment. A carrier oil is not needed for lavender essential oil. This is the only oil that can be applied to a skin tag without the need for dilution. Should I check with my doctor before using an essential oil? Yes. It normally is a good idea to see with your doctor about using EOs for you skin tags. This is especially true if you suffer from skin allergies, high blood pressure, or another medical condition. What is the best method for applying an essential oil to a skin tag? It is usually best to dilute the essential oil with a carrier oil. You should never apply any essential oil directly to a skin tag without first diluting it. You can use one of a number of suitable carrier oils to dilute your essential oils. These include jojoba, olive oil and coconut oil. Unfortunately, skin tags rarely disappear without some sort of intervention. Very occasionally, they can just drop off of their own accord but more often than not, skin tags remain on your skin and may even grow gradually over time. No, they are not. When people discover a skin tag on their body, they are often concerned but there is no need to worry. Skin tags may be annoying and unsightly but they are completely harmless. They are not cancerous and do not increase a person’s risk of developing skin cancer later. As well as the essential oil remedies that we have looked at in this article, there are a number of other traditional home remedies that many people have found to be effective. The following are some of the best. Instead of just throwing their banana peels away, people who want to treat a skin tag naturally should keep hold of them. Banana peels can help to dry out your skin tags fairly effectively. Simply apply a piece of the banana peel on top of the skin tag then keep it in place with a bandage overnight. Repeat each night until your tag eventually drops off. ACV is another effective remedy for a skin tag. The acid nature of the vinegar can break down the tissue around the tag helping it to drop off. Simply dip a cotton swab into the apple cider vinegar then place it over your skin tag. Cover the area with a bandage for around 30 minutes before washing and rinsing your skin. Repeat this treatment daily for a few weeks until the skin tag drops off. We are likely to develop more skin tags as we age. vitamin E is a powerful antioxidant that can help improve the skin’s health and fight many of the other signs of aging like wrinkles. By applying vitamin E to the skin tag, you may encourage it to disappear fairly quickly. All you have to do is massage a little liquid vitamin E over your skin tag every day until the growth disappears. Garlic is another potential home remedy for skin tags. It has excellent anti-aging properties and can improve your skin’s health and appearance by reducing inflammation. Crush up some garlic and apply it to the skin tag. Cover with a bandage and leave it in place overnight. Repeat the treatment for as long as necessary until the tag shrinks and finally disappears completely. What you choose to get rid of a skin tag is based on our individual preferences and methods of application. If you think applying an ointment is too messy, you may want to opt to use a spritzer, such as lavender and water. Lemon oil is an ideal oil to use if you want to make a cream and apply the substance at night. This oil is normally combined with a carrier oil, such as coconut oil. Never apply lemon essential oil in the sunlight, as it is photosensitive. Essential oils are the best treatments to use if you want to get rid of skin tags proficiently and quickly. You do not have to see a doctor about surgical removal, and the removal process does not need to be painful. All you need to do is apply the oil and wait until the skin tag dries and falls off. Just a drop of an essential oil mix is enough to shrink and dry a tag in only a matter of days. Why should you use painful removal techniques, when all you need to do is use the right oil? Essential oils are idea as they possess anti-inflammatory and antiseptic properties to clear the skin of the tags and similar skin deformities.